I first met writer Alexis Coe when I lived in the Bay Area and our mutual friend set us up to meet. I’m usually not expecting much on blind friend dates, but Alexis and I hit it off. (I think it also helped that we are both obsessed with our dogs.) Alexis wrote her first book, which was published in October, and she was kind enough to share about her writing process and how her first book tour went. 1) How did the idea for ALICE + FREDA FOREVER come about, and what was your process for getting a book deal with Zest, your publishers? I read about the case in grad school, and carried it with me for years. Friends in publishing didn’t want it. Historical Societies and museums I was working in didn’t want it. Publications didn’t want it—until the Toast was born. Nicole Cliffe and Mallory Ortberg made me their in-house historian, and they gave me a space to share the many historic women I want to write about. From there, an editor in the Bay Area was circling, and basically gave me the opportunity to name my project. (There are some “I told you so” moments I’m going to resist.) I immediately knew that I wanted to tell Alice and Freda’s story, and exactly how I wanted to tell it. Once they agreed to allow me to include illustrated primary sources, I was in. Next time around, it’ll be different. I don’t want that much control or responsibility. Writing a book is hard enough! Editors can approach me, but a deal will likely come out of a proposal my agent sends out. 2) Your book is based on a true story. To quote your book blurb, which sums up your novel nicely: “Nineteen-year-old Alice Mitchell planned to pass as a man and marry seventeen-year-old Freda Ward, but when their love letters were discovered, they were forbidden to ever speak again.” How did you research the story? What information did you gather to piece together their romance and history? I’m so glad you called it a “novel,” because that’s something I’ve noticed people say, but it isn’t fictitious. Alice and Freda were real people in 1892 Memphis. That being said, I think people call it a novel because it reads a bit like one, which is the GREATEST compliment you can give a nonfiction writer. (I can’t pretend that I didn’t love when the New Yorker said that . . . ) Writing an engaging narrative that never strays from the facts was a real challenge! I collected old newspaper articles for a few years, which allowed me to get a lay of the land. By the time I started the book in earnest, I knew most of the players and their motivations. From there, I read A LOT of nonfiction books about the period and different themes, like American modernity, all of which are listed in the extensive bibliography. There’s also a section in there about archives, which speak to the other primary sources I used, from courtroom proceedings to patient rolls. 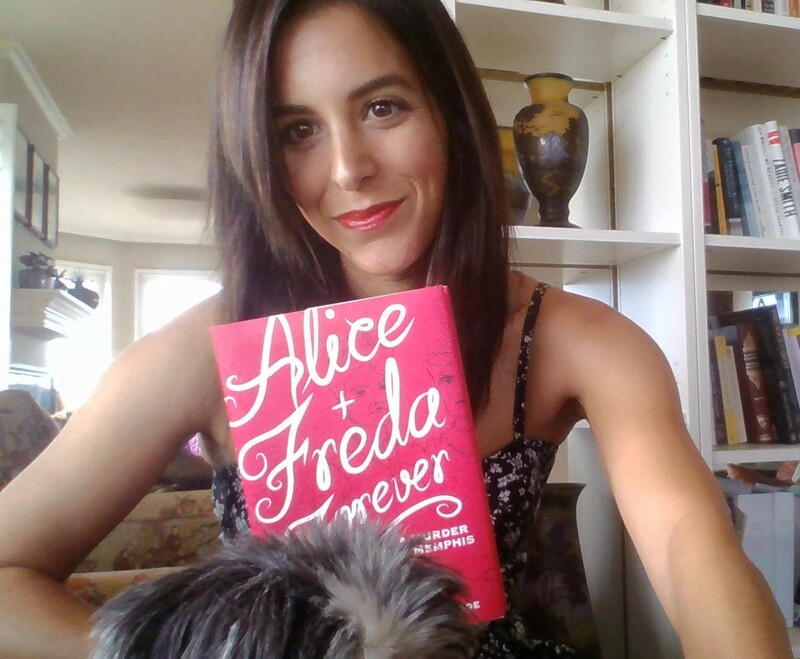 3) ALICE + FREDA FOREVER is beautifully illustrated. How did you find the right illustrator, and what was the collaboration process like for you? I contacted four artists I knew one way or another, and asked them to submit a sample cover. Pulp (the imprint they started for my book) offered their input, but the decision was up to me. After the artists turned in their work, it was clear to me that Sally Klann was the perfect woman for the job. I went to grad school with Sally’s older sister, Mary. I’ve had the privilege of watching her grow as an artist, both through commissions and exhibitions. I wrote a draft and highlighted sections I wanted Sally to illustrate, with more specific ideas placed in comments. For the first dozen or so illustrations, there were several exchanges. It was fun to have someone so involved who also felt like a confidante. After the first dozen, I wanted just a few things altered here and there, but for the most part, Sally either met or exceeded my expectations, and I’m in awe of her. 4) What have you learned through the process of writing your first creative nonfiction book? I can’t stress this enough, second readers are so important. They don’t have to be writers; it might be better if they work outside the field completely, or work in a field related to your book. I had four second readers, and I’m indebted to them: Mary Klann (Sally’s sister), Daniel Jacobson, Emily Clement, and Avi Steinberg. 5) You just came back from a book tour. Where did you go? Most importantly, how did Rosie (your pup) handle you being gone for a month? I did half dozen events in Memphis, made my way to Nashville for the Southern Festival of Books, came back to CA, and then had a very busy week and a half in NYC. It was wonderful. I was really nervous going into it, and in a cruel and wonderful turn of fate, the first stop on my book tour was a 7am live television appearance. After that, I felt relatively prepared to experience anything, and let go off all attachment to my known, everyday life. It was all different, and I had to adapt. By the end of that day, which also included a couple of signings, a radio interview, and my first big reading, I felt ready for just about anything. I must confess, I like being in conversation with someone onstage more than reading excerpts (though I often do read them even when I’m in conversation), and I suspect the audience does, too. Oh, Rosie! She wasn’t very happy about any of it, from the attention writing the book took away from her to the tour. When I came home, she went nuts for an hour, and then fell asleep. She holds no grudges. I aspire to be like her. You can follow Alexis on Twitter at @Alexis_Coe and on her Facebook page. This book sounds amazing! Adding it to my to-read list. I’m so glad, Angie! Hope you enjoy. If you have any questions, you can post them here and Alexis can answer them. Happy holidays!